The 5-0 victory over St Johnstone gave Celtic the perfect preparation for Europe. Brendan Rodgers has said that Celtic look ahead to facing Valencia with "excitement" and "big confidence" after thumping St Johnstone in the Scottish Cup. Scott Sinclair scored a hat-trick, with James Forrest and Scott Brown also on the scoresheet as Celtic's strong start to 2019 continued. That puts them in a good place ahead of their Europa League tie against the Spanish side, according to the manager. "It is another good performance, really focused, not giving away too much," Rodgers said. "We know it is a big step up for us on Thursday in terms of quality but I can't complain. "We are into the middle of February and we haven't conceded a goal, working very hard, players looking fresh and playing at a really good level. "So it was good preparation. We bring big confidence into the game. We understand the level of opponent. "We are so excited for the game, it is a great game for us, the first leg of a European tie and we will be ready for it." The victory against St Johnstone extended Celtic's winning streak in domestic cups to a record 24 games and Rodgers revealed he hadn't made anything of that stat in his preparations. "I didn't want to mention it before, there is enough demand from me on them to perform well and win," he said. "But the consequence of it is they break a record, another great tribute to how well they have been working for two and half years." Rodgers also gave an update on Jozo Simunovic, wh ocame off at half-time due to illness, and Oliver Burke, who was substituted with an ankle knock, saying neither was serious and that the pair would likely be fit to face Valencia. But Olivier Ntcham, who was back in the squad after a hamstring injury, was replaced on the bench by Mikey Johnston at the last minute. 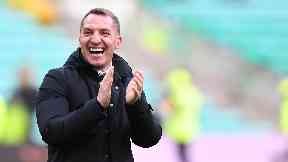 Rodgers said: "He felt a tightness in his hamstring in the warm-up. It didn't go but he felt it was too much of risk. We will probably scan that tomorrow to make sure." St Johnstone boss Tommy Wright had no complaints about the result, saying his team were "beaten by a far better side." He said: "Effectively we lost the tie in first nine minutes with two goals. "They have so much quality. There is no disgrace getting beaten by a team who are at the moment wiping the floor with everybody. We need to accept that and move on."